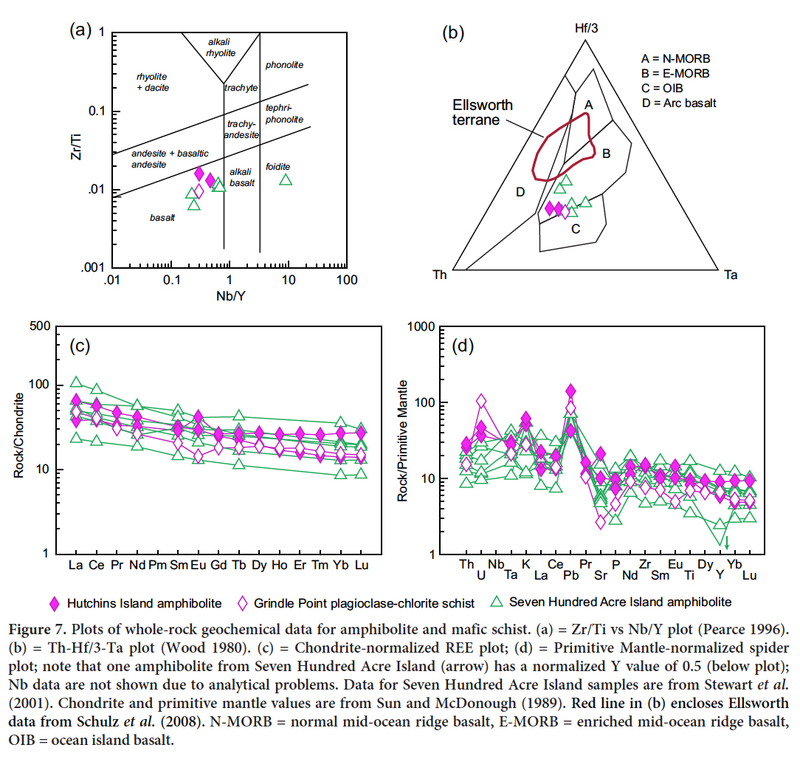 Articles - U–Pb zircon geochronology of Proterozoic and Paleozoic rocks, North Islesboro, coastal Maine (USA): - links to West Africa and Penobscottian orogenesis in southeastern Ganderia? links to West Africa and Penobscottian orogenesis in southeastern Ganderia? Within the Ganderian inlier of Penobscot Bay, coastal Maine, the Islesboro fault block occupies a central position between the St. Croix terrane of continental affinity and, to the east, the Ellsworth terrane of oceanic affinity. New field, petrographic, geochemical, and U–Pb LA-ICP-MS geochronological data on detrital and magmatic zircon grains constrain the provenance and transfer history of these terranes from Gondwana to the Appalachian margin of Laurentia. On North Islesboro, the Coombs Limestone and Hutchins Island Quartzite (new name), intruded by E-MORB amphibolite, constitute a newly recognized local inlier of Proterozoic basement. Together with the nearby Seven Hundred Acre Island Formation, these mature, carbonate-rich strata record deposition on a low-latitude passive margin. Abundant detrital zircon grains in the Hutchins Island Quartzite, all older than ca. 1.8 Ga, have a predominant population at ca. 2.0 Ga and a small peak between ca. 2.8 Ga and 2.4 Ga, an age spectrum strikingly similar to those of both the Paleoproterozoic Taghdout Quartzite in Morocco, on the West African craton, and basement rocks from Georges Bank, offshore Massachusetts. The overlying Neoproterozoic–Cambrian Islesboro Formation records a second period of extension (interstratified EMORB greenstone) synchronous with accumulation of interbedded siliciclastic and carbonate sediment, prior to recumbent folding. At the base of the moderately deformed Turtle Head Cove (new name) cover sequence, immature greywacke has a youngest zircon population of ca. 515 Ma, large late Neoproterozoic populations (ca. 624 Ma and 678 Ma), a small peak at 1.2 Ga, a moderate number of ca. 1.5 Ga to 2.0 Ga grains, and a few Late Archean grains. Compared with many similar Ganderian age spectra reported from Vermont to New Brunswick, which are all consistent with a source in either the Amazonian or West African cratons, this new age spectrum most closely resembles those from quartzites in the Grand Manaan and Brookville terranes of coastal New Brunswick. Significantly, exotic blocks lithologically indistinguishable from Proterozoic strata on Islesboro occur in the St. Croix terrane within a Lower Ordovician black shale mélange at the base of the Penobscot Formation, suggesting that the St. Croix terrane, Islesboro block, and Ellsworth terrane were initially juxtaposed by Penobscottian thrusting prior to the Middle Ordovician. Subsequently, the Islesboro block was isolated between the bounding post-Silurian, pre-Late Devonian Turtle Head and Penobscot Bay dextral strike-slip faults. Along the North Islesboro fault, a fault-bounded lens of foliated pyritic felsic volcanic and volcaniclastic rock, dated at ca. 372 Ma and containing Devonian to Archean detrital zircons, records late Paleozoic deformation recognized previously in coastal New Brunswick but not in Penobscot Bay. Dans la baie Penobscot, sur la côte du Maine, le bloc de failles d’Islesboro occupe une position centrale entre le terrane d’affinité continentale de St. Croix et, à l’est, le terrane d’affinité océanique d’Ellsworth. De nouvelles données géochronologiques de terrain, pétrographiques, géochimiques et U-Pb LA-ICP-MS sur les grains de zircon détritique et magmatique limitent la provenance et l’historique de transfert de ces terranes du Gondwana à la marge appalachienne de la Laurentie. À Islesboro Nord, le calcaire de Coombs et le quartzite de Hutchins Island (nouveau nom), intrusés par l’amphibolite de la basalte de dorsale médio-océanique, constituent une nouvelle entaille locale du socle protérozoïque. Conjointement avec la formation de Seven Hundred Acre Island située à proximité, ces strates matures et riches en carbonates témoignent d’un dépôt sur une marge passive de faible latitude. Les grains de zircon détritiques abondants dans le quartzite de Hutchins Island, tous âgés de plus de 1,8 Ga, ont une population prédominante aux environs de 2,0 Ga et un petit pic entre la période de 2,8 Ga et 2,4 Ga, un spectre d’âge étonnamment similaire à ceux du quartzite palzoprotérozoïque Taghdout au Maroc, sur le craton ouest-africain, et des roches du socle de Georges Bank, au large du Massachusetts. La formation d’Islesboro datant du Néoprotérozoïque-Cambrien sus-jacent enregistre une seconde période d’extension (interstratification de roches vertes de la basalte de dorsale médio-océanique) synchrone avec l’accumulation de sédiments siliciclastiques et carbonatés interstratifiés, avant le plissement du gisement. À la base de la séquence de couverture de Turtle Head Cove (nouveau nom) modérément déformée, le greywacke immature a une plus jeune population de zircon d’environ 515 Ma, de grandes populations néoprotérozoïques tardives (624 Ma, 678 Ma), un petit pic à 1,2 Ga, un nombre modéré de grains de 1,5 Ga à 2,0 Ga, et quelques grains de l’Archéen tardif. Comparé à de nombreux spectres d’âge ganderiens similaires du Vermont au Nouveau-Brunswick, qui correspondent tous à une source dans les cratons amazoniens ou ouest-africains, ce nouveau spectre d’âge ressemble le plus à ceux des quartzites des terres côtières de Grand Manan et de Brookville au Nouveau-Brunswick. De manière significative, des blocs exotiques lithologiquement indiscernables des strates protérozoïques d’Islesboro se trouvent dans le terrane de St. Croix à l’intérieur de la formation de Penobscot, ce qui suggère que le terrane de St. Croix, le bloc d’Islesboro et le terrane d’Ellsworth étaient initialement juxtaposés. par une poussée de l’arc penobscottien avant l’Ordovicien moyen. Par la suite, le bloc d’Islesboro a été isolé entre les failles limites post-siluriennes de Turtle Head datant du pré-Dévonien tardif et les failles de décrochement dextres de la baie Penobscot. Le long de la faille d’Islesboro Nord, une lentille fendue de roches volcaniques pyriteuses felsiques et volcanoclastiques, datée d’environ 372 Ma et contenant des zircons détritiques du Dévonien à l’Archéen, enregistre la déformation tardive du Paléozoïque reconnue précédemment sur les côtes du Nouveau-Brunswick, mais pas dans la baie Penobscot. 1 The Appalachian–Caledonide orogen (Hibbard et al. 2006; Fig. 1) has yielded fundamental insights into Earth history, paleogeography, and processes (e.g., Wilson 1966), yet continues to present significant questions. In contrast to the western peri-Laurentian flank of the orogen, which is relatively well understood in terms of Ordovician continent-arc collision (e.g., Karabinos et al. 2017), the eastern peri-Gondwanan realm comprises a complex mosaic of pre-Silurian terranes with a much more contentious tectonic evolution (Murphy et al. 2004; Fyffe et al. 2011; Pollock et al. 2012). Ganderia, the most outboard of several peripheral Gondwanan domains, was first to accrete to Laurentia and has proved especially challenging to interpret owing to a protracted history of deformation and magmatism (e.g., Hibbard et al. 2007). Figure 1. Lithotectonic divisions of the northeastern Appalachian orogen (after Hibbard et al. 2006). 2 In Penobscot Bay,Maine, a Ganderian inlier of Ordovician and older rocks exposes the St. Croix terrane of continental affinity and, to the east, the Ellsworth terrane of sharply contrasting oceanic affinity (e.g., εNd [500 Ma] +5.6 to +8.6; Schulz et al. 2008) that contains abundant marine volcanic rock and rare upper-mantle peridotite (Fig. 2). The inlier is juxtaposed via the Sennebec Pond Fault against strata of the Fredericton Trough on the northwest; it underlies by angular unconformity Silurian strata of the Coastal Volcanic Belt on the southeast. The narrow Islesboro block (Stewart et al. 1995; Stewart 1998), bounded by the Turtle Head and Penobscot Bay faults, occupies a central position within the inlier (Fig. 2). This block hosts the oldest known Precambrian basement in Maine plus distinctive carbonate units, and as well shares several lithologic and structural features with both the St. Croix and Ellsworth terranes (Berry and Osberg 1989; Stewart 1998). Figure 2. Regional geologic map showing location of Islesboro in Penobscot Bay, Maine, USA (modified from Osberg et al. 1985). 3 Williams (1978) originally included the St. Croix terrane within the Avalon zone based on correlation with strata in the Saint John area of coastal New Brunswick. Subsequently, informed by a field trip in the Penobscot Bay region led by D.B. Stewart in 1999, van Staal et al. (2004) assigned the St. Croix terrane to Ganderia (Fig. 1). In particular, the Megunticook Formation was found to closely resemble the Crocker Hill Formation of the Lower Cookson Group in southwestern New Brunswick. This re-interpretation allows for the existence of an Avalon Seaway that accounts for the distribution of arc rocks, high-pressure metamorphism, and seismic reflections related to the latest Silurian–Middle Devonian Acadian collision between Avalonia and Ganderia (van Staal et al. 2009). Additionally, van Staal et al. (1998, 2012) presented extensive arguments for Ganderia having originated near the Columbian margin of South America and for a Middle to Late Cambrian departure from Gondwana. Johnson et al. (2012) documented pre-Middle Ordovician (Penobscottian) deformation in the Annidale terrane of New Brunswick; Reusch and van Staal (2012) speculated that a quartz-pebble conglomerate in southwestern Penobscot Bay might record a nearby pre-Middle Ordovician Penobscottian event. 4 Smith et al. (1907) defined the Islesboro Formation (Fig. 2) including carbonate members and the uppermost Coombs Limestone member, and correlated overlying rocks with the Battie Quartzite of the St. Croix terrane. Stewart and Lux (1988) reported Neoproterozoic ages for the amphibolite-facies Seven Hundred Acre Island Formation, exposed beneath the Islesboro Formation along an antiform. Berry and Osberg (1989) described a third sequence, which we refer to here informally as the Turtle Head Cove unit, interpreted to overlie both the Islesboro and Seven Hundred Acre Island formations with profound unconformity; of note, Stewart (1998) did not separate this third sequence from the Islesboro Formation. 5 In general, the identities of peri-Gondwanan elements (e.g., Landing 1996; Fyffe et al. 2011; Pothier et al. 2015), their provenance (e.g., Nance et al. 2008; Barr et al. 2012, 2014), and mechanisms of transfer to the Appalachian margin of Laurentia (e.g., Neuman and Max 1989; van Staal et al. 2012; Waldron et al. 2014b) remain matters of ongoing debate. Fundamental problems of both local and broader significance include (1) provenance of the Islesboro basement; (2) relationship to the rifting of Ganderia from Gondwana and subsequent opening of the Rheic Ocean (Schulz et al. 2008; Nance et al. 2012; van Staal et al. 2012); (3) mechanism of juxtaposition of the St. Croix-Ellsworth terranes; (4) timing of the juxtaposition; and (5) whether, during closure of the Iapetus Ocean (between Ganderia and Laurentia), subduction was initiated internally (van Staal et al. 2012) or not (Waldron et al. 2014). 6 The purpose of our reconnaissance investigation of Islesboro is to expand the geochronological database by U–Pb dating of detrital and igneous zircon in samples of metasedimentary and volcaniclastic rock from this critical area. We collected samples from a quartzite that Stewart (1998) showed at the top of the Islesboro Formation (Fig. 3); greywacke from the base of the Turtle Head Cove unit (Fig. 4); and a volcaniclastic rock from the Kedears Hill sulphide prospect (Fig. 4). The geochronological results require a reevaluation of both local field relationships and, in light of recent detrital zircon studies in West Africa (Abati et al. 2010; Bradley et al. 2015) and offshore Massachusetts (Kuiper et al. 2017), global paleogeography. Figure 3. 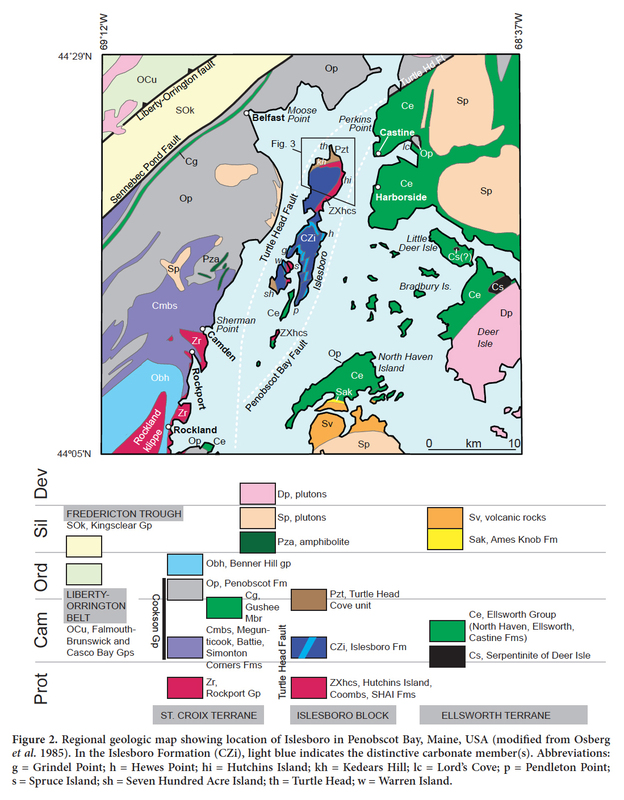 Simplified geologic map of North Islesboro (modified from Stewart 1998). Figure 4. Detailed geologic map of Kedears Hill area showing North Islesboro fault (location after Stewart 1998) and splays. Location of corners is indicated by UTM coordinates. 7 West of the Turtle Head Fault (Fig. 2), the St. Croix terrane (Tucker et al. 2001) comprises, in ascending stratigraphic order, the Rockport, Cookson, and Benner Hill groups. The Proterozoic Rockport Group (Berry in press) is capped by the Coombs Limestone and Rockport Quartzite, which are in turn unconformably overlain by conglomerate and sandstone of the Simonton Corners Formation. The latter basal unit of the Cookson Group is correlated across the West Rockport Fault with the Megunticook Formation that is locally underlain conformably by the Battie Quartzite. The Megunticook Formation comprises a sequence of quartzite and quartz-mica schist (Bickel 1971; Berry and Osberg 2000). The structurally overlying Penobscot Formation, also part of the Cookson Group, consists of rusty black schist with rare quartzose sandstone (Bickel 1971). The Penobscot Formation is correlated with the Calais Formation, which near the Maine-New Brunswick border contains Tremadocian graptolites (Fyffe et al. 2011). The latest Cambrian Gushee Member of the Penobscot displays a clear island-arc geochemical signature (Burke et al. 2016). Highest in the sequence, the Benner Hill Group is notable for containing the only pre-Silurian fossils in the region, which are highly stretched brachiopods of Caradocian (~Sandbian) age (Berry et al. 2000). 8 The Ellsworth terrane comprises a structurally complex assemblage of low-grade, but highly deformed, chloritequartz-feldspar schist, Middle Cambrian marine bimodal volcanic rock (e.g., North Haven Greenstone, Castine Volcanics), rare pelagic sedimentary rock, and rare serpentinized peridotite (Fig. 2). The thickness of this terrane, based on seismic studies, is on the order of several kilometers (Stewart 1998). The presumed steeply dipping Turtle Head Fault juxtaposes the Ellsworth and St. Croix terranes both to the northeast and southwest of Islesboro. However, in several locations (Fig. 2), Ellsworth rocks directly overlie black shale of the Penobscot Formation in an inferred thrust fault relationship. East of Castine, the Penobscot Formation is exposed in the Lord’s Cove window (Osberg et al. 1985; Reusch 2002a, 2002b). On the northwest shore of North Haven Island, Penobscot Formation black shale is injected into overlying fractured North Haven Greenstone (Reusch et al. 2003); east of Rockland, pillow lavas of the North Haven Greenstone are thrust over Penobscot Formation (Osberg et al. 1985). The maximum age of this thrusting event is Early Ordovician. The Turtle Head and related steep faults, according to Stewart et al. (2001), show dextral offsets of Late Silurian isograds that pre-date Late Devonian plutons. On North Islesboro, Stewart (1998) showed a narrow belt of Middle Cambrian Castine Volcanics, one of the marine volcanic units of the Ellsworth terrane, bounded by splays of the Turtle Head Fault (Fig. 2). 9 Strata within the Islesboro fault block (Stewart 1998) include, in ascending order, the amphibolite-facies Seven Hundred Acre Island Formation of Proterozoic age (Stew-art et al. 2001), the greenschist-facies Islesboro Formation of undefined age (Smith et al. 1907), and the third sequence of Berry and Osberg (1989) here referred to as the Turtle Head Cove unit. 10 The Seven Hundred Acre Island Formation (Brookins 1976; Stewart 1998) comprises a platform sequence of marble (Fig. 5E), quartzite, quartz-rich schist, and sparse amphibolite. It was metamorphosed to amphibolite facies during the Neoproterozoic based on 40Ar/39Ar ages of ca. 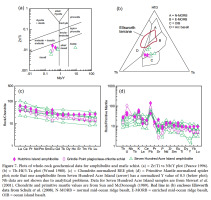 670 to 650 Ma for hornblende from amphibolite, and on a U–Pb age of 646.7 ± 2.7 Ma for zircon from a cross-cutting granitic pegmatite (Stewart et al. 2001). 11 The Islesboro Formation, which surrounds fault-bounded inliers of the Seven Hundred Acre Island Formation (Stewart 1998), consists of heterogeneous siliciclastic rock (Fig. 5D) and lesser carbonate rock. Distinctive brown-weathering carbonate members (Figs. 2 and 5A), shown separately on previous maps, constrain the internal structure of this unit. 12 The Turtle Head Cove unit consists of low-grade sedimentary rock present on the west side of Seven Hundred Acre Island and northwest side of North Islesboro. On Seven Hundred Acre Island, a basal conglomerate and sandstone grade upward into predominant phyllite and lesser sandstone (Fig. 5B and 5C). This unit was interpreted by Berry and Osberg to overlie the Islesboro and Seven Hundred Acre Island formations with angular unconformity. Figure 5. 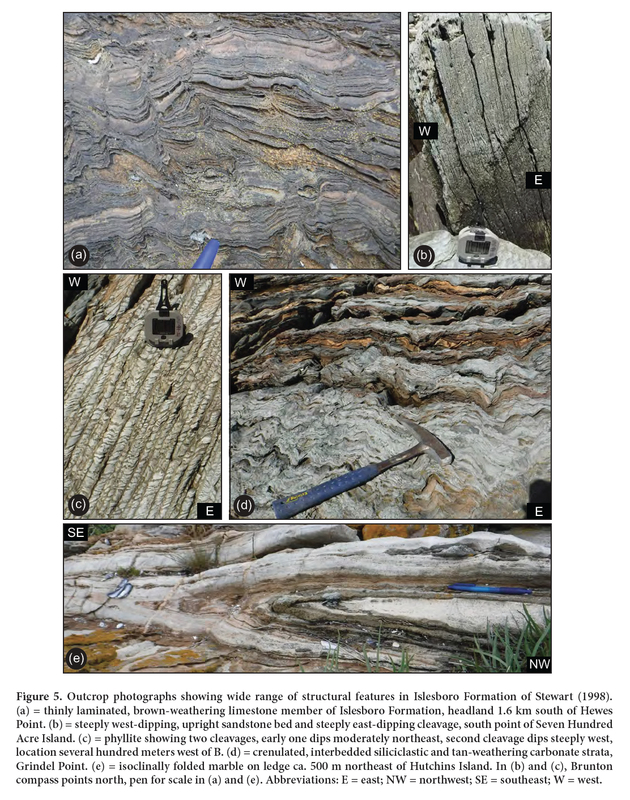 Outcrop photographs showing wide range of structural features in Islesboro Formation of Stewart (1998). 13 On North Islesboro (Fig. 3), the first published geologic map (Smith et al. 1907) shows two gently plunging synclines cored by Battie Quartzite, one in the west extending north towards Kedears Hill and the other located in the Parker Cove-Hutchins Island-Coombs Cove area. The map by Osberg et al. (1985) delineates the intervening, northeast-plunging anticline. In addition, Osberg et al. (1985) added a thrust fault that places the Islesboro Formation over presumably younger rocks to the north on Turtle Head. Stewart et al. (2001) retained the central anticline and eastern syncline, returned the rocks on Turtle Head to the Islesboro Formation, retained a fault, here named the North Islesboro Fault, in the same location as the thrust of Osberg et al. (1985), and added several other faults. Figure 3 attempts to reconcile our reconnaissance field observations with the geology shown on these previously published maps. 14 In the eastern part of North Islesboro (Fig. 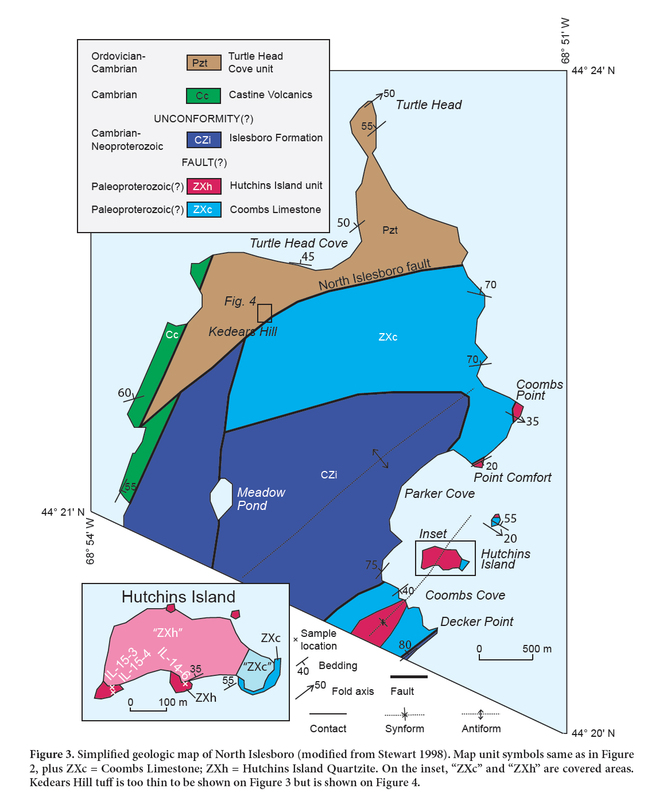 3), the Coombs Limestone (ZXc) and overlying Hutchins Island Quartzite (ZXh) constitute a newly recognized area of high-grade Proterozoic basement. Our field observations generally support the quartzite-cored syncline shown on previous geologic maps (Smith et al. 1907; Osberg et al. 1985; Stewart 1998) that extends southward from east of Coombs Point through Hutchins Island to the central small headland on the south shore of Coombs Cove. Specifically, the quartzite unit overlies the carbonate unit at Point Comfort, in Coombs Cove on the western limb of the syncline close to its axial trace, at the eastern headland of Hutchins Island on the eastern limb, and at the north end of the small ledge to the northeast (Fig. 3). Not shown on previous maps are small lenses of amphibolite present in the southwestern part of Hutchins Island (sample locations IL-15-3 and -4). 15 The type locality of the Coombs Limestone (Smith et al. 1907) is Coombs Point. This carbonate unit crops out between Coombs Point and Point Comfort, along the southern shore of Coombs Cove, the eastern headland of Hutchins Island, and on a small ledge to the northeast. It consists of thin- to thick-bedded, grey calcitic and buff to brown-weathering dolomitic marble (Fig. 5E), minor quartzite, both white and pink, and sparse calc-silicate rock. 16 The Hutchins Island Quartzite crops out at Coombs Point, Point Comfort, Hutchins Island, and on the hill south of Coombs Cove. An occurrence of cross beds at Point Comfort (H.N. Berry IV, written communication, 1999) suggests that the quartzite conformably overlies the Coombs Limestone. On the south shore of Hutchins Island, thick-bedded white quartzite was sampled for detrital zircon (Fig. 3; Sample IL-14-6; 44°21.042ʹN, 68°52.244ʹW). 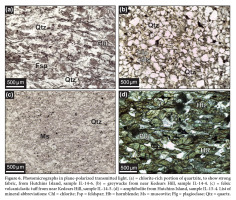 Thin sections of the quartzite reveal locally abundant chlorite and feldspar, and a strong penetrative fabric (Fig. 6A). Nearby outcrops and those in the southwest part of the island are quartzo-feldspathic gneiss and schist, and rare, discontinuous, thin (<1 m) lenses of amphibolite. The amphibolite is medium grained, contains abundant chloritized hornblende and sericitized plagioclase, and displays a strong fabric (Fig. 6D). 17 At least two generations of folds are present. A presumably older generation consists of open to isoclinal, variably northwest- to southeast-plunging folds with a steeply dipping axial-planar foliation. These folds are nearly perpendicular to the contacts with adjacent Islesboro Formation, suggesting a structural discordance. Other observed structures include common boudinaged beds of quartzite and dolomitic marble, southwest-plunging folds, and late faults. 18 Several observations suggest that the contact relationship of the Proterozoic basement with the adjacent Islesboro Formation (CZi) may be a fault. On the western shore of Coombs Cove, in rocks mapped as Islesboro Formation, graded beds indicate tops to the northwest, opposite the inferred east-younging direction of the western limb of the syncline. On the east shore of Decker Point, rocks mapped as Islesboro Formation (Stewart 1998) are lithologically distinct compared to those on the western shore of Coombs Cove. Finally, the presence of amphibolite on Hutchins Island indicates a metamorphic discordance across the contact, in addition to the structural discordance described above. We are unable to determine whether the Precambrian basement inliers are horsts or klippes. 19 Based on lithologies and field relationships, the Proterozoic basement of Coombs Limestone and Hutchins Island Quartzite on North Islesboro correlates with the Seven Hundred Acre Island Formation of Stewart (1998) exposed in nearby inliers. In addition, these rocks may also be equivalent to the upper part of the Rockport Group of Osberg et al. (1985) exposed on the western shore of Penobscot Bay. Figure 6. Photomicrographs in plane-polarized transmitted light. 20 Smith et al. (1907) did not designate a specific type locality for the Islesboro Formation. However, the shoreline outcrops of interbedded siliciclastic and minor carbonate rock at Grindel Point (Figs. 2 and 5D) have been taken as representative (e.g., Berry 2007). The presence there of interstratified and discordant greenstone distinguishes the Islesboro Formation from the amphibolite-bearing Seven Hundred Acre Island Formation, and also from the weakly metamorphosed and less-deformed (Fig. 5B) Turtle Head Cove unit in which greenstone is evidently absent. At Grindel Point, thin-bedded siliciclastic strata and distinctive orange-weathering carbonate are inter-bedded (Fig. 5D). Rare sandstone lenses several millimeters thick and several centimeters long, oriented obliquely to bedding, are possible worm burrows (e.g., Berry 2007, photo 10, near center). Beds dip generally north, display very tight horizontal folds (Berry 2007), and are strongly crenulated on moderately north-plunging folds. Conformable greenstone beds, likely mafic tuff, occur in places. Discordant greenstone dykes up to 5 m thick cut the foliation. The thinly bedded, crenulated aspect of these outcrops and presence of abundant greenstone are features of the Ellsworth Schist (Reusch 2003), a potential correlative. 21 The Islesboro Formation is lithologically heterogeneous. On the western shore of Coombs Cove, to the southwest of Hutchins Island, distinctively thin-bedded, fine-grained siliciclastic strata display graded beds; similar distinctively thin-bedded strata, including packages of “ribbon” carbonate, are present on the west shore of Pendleton Point (Fig. 2). To the east of Coombs Cove, in cliffs along the eastern shore of Decker Point (Fig. 3), steeply dipping, massive, light-weathering strata (feldspathic slate of Stewart 1998) strike south-southeast; similar massive, light-weathering rocks at Hewes Point (Fig. 2), a few kilometers to the southeast, display two cleavages but extremely sparse bedding. Decker Point itself is held up by a resistant siliceous rock of uncertain protolith and relationship to adjacent units. 22 A narrow belt of Castine Volcanics crops out along the western shore of North Islesboro (Stewart 1998). At the headland west of Meadow Pond (Fig. 3), this unit, although shown as quartzite and conglomerate by Stewart et al. (2001), consists of thick-bedded tuffaceous sedimentary rock, tuff, and lithic tuff. The outcrops are rusty due to minor disseminated pyrite. These strata display only a weak penetrative deformation. Possible correlatives include the felsic volcanic and volcaniclastic rocks at the Kedears Hill sulphide prospect (in which case this unit was incorrectly correlated with the Castine Volcanics), and also the undated volcaniclastic rocks at Perkins Point (Fig. 2) north of Castine (Smith et al. 1907). 23 Rocks northwest of the North Islesboro fault (Fig. 3) display a low grade of metamorphism relative to those southeast of the fault. Whereas locally two cleavages are present in these northwestern strata (e.g., Gregg 1979; Fig. 5C), in general the structure is characterized by a relatively open fold style and steeply dipping slaty cleavage of presumed pressure-solution origin (Gregg 1986). 24 The Kedears Hill area contains important outcrops used for geochronology in this study. Our mapping (Fig. 4) suggests that several unrelated units are juxtaposed along splays of the North Islesboro fault. In the excavated area on the northeast side of Kedears Hill, the four units we recognize are therefore described in geographic order. 25 The first unit, occurring in the most southeastern exposures, is orange-weathering calcareous phyllite that carries a well-developed, steeply dipping foliation and in places is highly sheared and cut by irregular quartz ± carbonate veins. A recent excavation exposes a thin tuff bed and southeast-dipping fault surface (Fig. 4). 26 Northwest of the calcareous phyllite and a thin strip of pyritic black shale is the second unit that comprises poorly exposed felsic volcanic rocks within the excavated area, including a previously undescribed sulphide prospect (Fig. 4). Massive white albite-rich rhyolite occurs along a ridge located approximately 40 m to the southwest of the prospect, in nearby sub-crop, and as several 2- to 3-m, iron-stained boulders that contain abundant, 1–3 cm clots of coarse pyrite. A small roadbed 25 m to the north of the excavated area exposes a rusty weathering, strongly foliated felsic rock that was sampled for zircon (IL-14-5; 44°22.454ʹN, 68°53.613ʹW). The wide range of ages obtained for this rock (see below) supports an origin as a volcaniclastic sediment, referred to here for simplicity as a tuff. Thin section study shows predominant quartz with lesser muscovite (Fig. 6C); textures, including the presence of doubly terminated euhedral zircon grains without evidence of sedimentary abrasion, suggest a significant ash component. 27 Approximately 40 to 50 m to the southwest of the prospect is the third unit in the excavated area, consisting of several outcrops of massive, quartz-rich greywacke (sample IL-14-4; 44°22.429ʹN, 68°53.652ʹW). We consider these strata to be the basal part of the Turtle Head Cove unit based on more complete exposures of a nearly identical sequence on the southwestern shore of Seven Hundred Acre Island. Minor pyrite occurs in disseminations and locally in thin (1–3 mm) laminae. In thin section (Fig. 6B), the sand grains are angular and poorly size-sorted, surrounded by a volumetrically minor matrix of chlorite and muscovite. 28 The fourth unit, considered to conformably overlie the greywacke, is extensively exposed in the larger, non-metallic quarry to the northwest (Fig. 4) and on both shores of Turtle Head Cove ca. 1 km to the northeast (Fig. 3; Gregg 1979). This unit consists of pervasively Mn-stained, grey-green mudstone and shale locally containing sparse, white, centimeter-sized possible lapilli and elongate, small (1–2 cm) lenses of quartz ± carbonate. Interbedded greywacke is volumetrically minor. These rocks are at most weakly metamorphosed and display a prominent, steeply dipping, northeast-striking cleavage; a second cleavage is much less prominent, more widely spaced, and dips moderately southeast. 29 The east shore of Turtle Head contains nearly continuous outcrops of moderately northwest-dipping, interbedded sandstone and grey to black shale. Many of these outcrops have a white-weathering rind, thus suggesting a tuffaceous component. Carbonate-rich sandstone is locally present, including several beds that contain angular clasts of pyrite up to ~1 cm in diameter. The northernmost headland—Turtle Head—displays open folds that plunge gently northeast around a near-vertical cleavage (Fig. 3). 30 Samples for whole-rock geochemistry were pulverized in an alumina-ceramic mortar and analyzed at Activation Laboratories Ltd.in Ancaster, Ontario. Analyses were made on duplicate samples and on 8 to 12 standards. 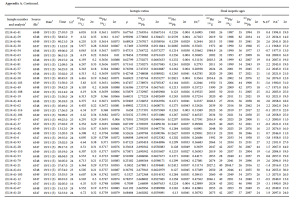 Precision and accuracy for concentrations ≥100 × the minimum detection limit (MDL) generally were better than ±5% relative, and in many cases, such as for major elements, were better than ±1% relative. 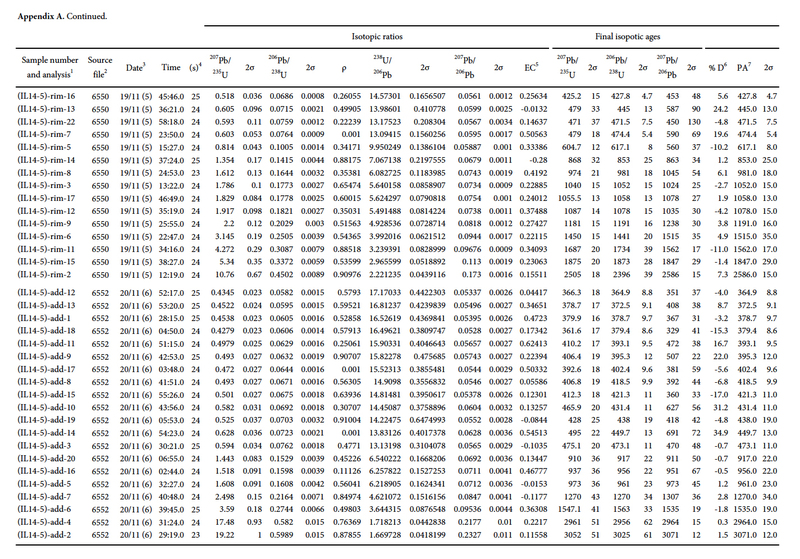 For concentrations approximately 10× the MDL, precision and accuracy were about ±10 to 20% relative, depending on the method used. Major, most trace, and all rare earth elements (REE) were determined by inductively coupled plasma-mass spectrometry (ICP-MS) on rock powders fused with lithium metaborate/tetraborate in order to insure complete acid dissolution of resistate minerals prior to analysis. Instrumental neutron activation analysis (INAA) was used for Au, As, Sb, Se, Sc, Cr, Br, and Ir because of lower detection limits. Total carbon and sulphur were determined by a LECO infrared analyzer, and CO2 by coulometry after digestion with 2N perchloric acid. Details of the various analytical methods are available online at www.actlabs.com. 31 Analyses of zircon grains were conducted using a Nu Instruments AttoM ES™ high-resolution, sector-field, ICPMS coupled to a Photon Machines Excite™ 193 nm ArF excimer laser (LA-ICP-MS) at the USGS Southwest Isotope Research Laboratory in Denver, Colorado. Zircon was ablated using a ~25 um spot size, 150 total bursts per analysis with a repetition rate of 5 Hz, laser energy of ~3 mJ, and energy density of 4.11 J/cm2 . Pit depths are typically ~20 µm or less. The rate of He carrier gas flow from the HelEx cell of the laser was ~0.6 L/min. Make-up Ar gas (~0.2 L/min) was added to the sample stream prior to its introduction into the plasma. 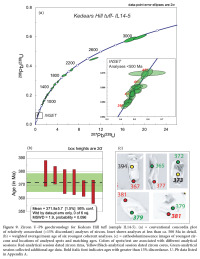 Nitrogen with a flow rate of 5.5 mL/min was added to the sample stream to allow for significant reduction in ThO+/Th+ (<0.5%) and improved the ionization of refractory Th (Hu et al. 2008). With the magnet set at a constant mass, the flat tops of the isotope peaks of 202Hg, 204(Hg + Pb), 206Pb, 207Pb, 208Pb, 232Th, 235U, and 238U were measured by rapidly deflecting the ion beam with a 30 s on-peak background measured prior to each 30-s analysis. Raw data were reduced off-line using Iolite™ 2.5 (Paton et al. 2011) to subtract on-peak background signals, correct for U–Pb downhole fractionation, and normalize the instrumental mass bias using external mineral reference materials, the ages of which were determined previously by IDTIMS. Ages were corrected by standard sample bracketing with the primary zircon reference material Temora2 (ca. 417 Ma; Black et al. 2004) and secondary reference material Plešovice (ca. 337 Ma; Sláma et al. 2008), and an in-house standard WRP-63-08 (ca. 1707 Ma; W. Premo, personal communication, 2016). For igneous zircon, rims and cores were analyzed if revealed in SEM-CL and large enough for analysis. 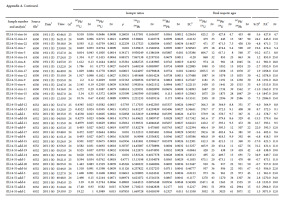 Reduced data were compiled using Isoplot 4.15 (Ludwig 2012). 206Pb/238U ages are reported for igneous zircon samples less than ~1300 Ma, whereas 207Pb/206Pb ages are used for older ages (Appendix A) following the recommendations of Gehrels (2011). Analyses that are more than 15% discordant (206Pb/238U age relative to 207Pb/206Pb age), or more negative than -10% discordant, are excluded from the probability density plots. 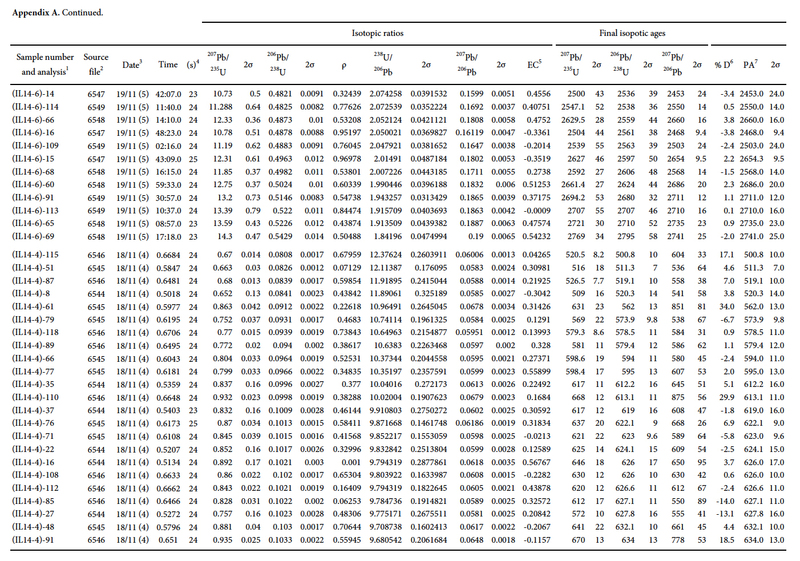 32 Whole-rock analyses of metasedimentary and meta-igneous rocks are presented in Table 1. 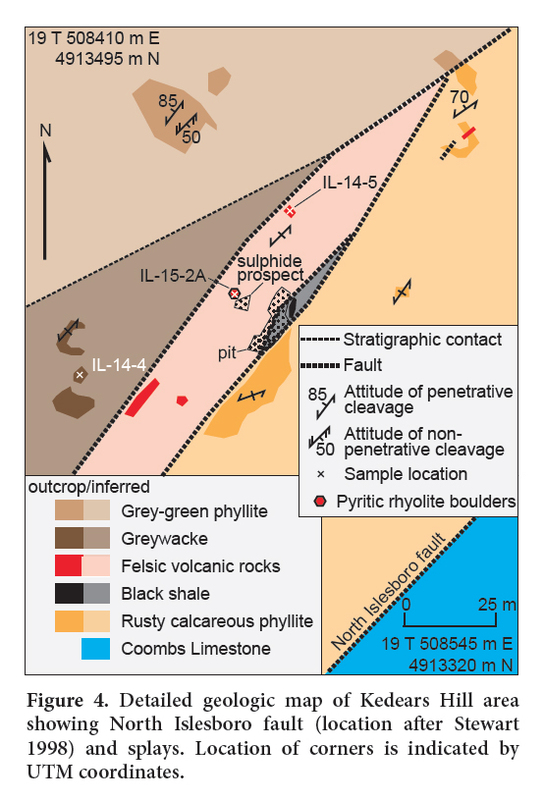 On the south side of Hutchins Island, quartzite sample IL-14-6 is distinguished by high SiO2 (80.92 wt %). 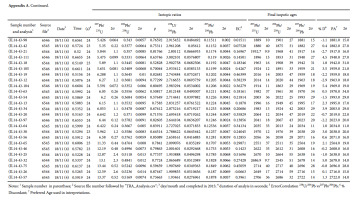 Nearby amphibolite samples IL-15-3 and IL-15-4, within the same sequence, contain relatively high Fe2O3T (13.90 and 13.78 wt %, respectively) and TiO2 (2.05 and 1.78 wt %, respectively). Plagioclase-chlorite schist sample IL-15-5 from Grindel Point is broadly similar to the amphibolite samples in terms of major-element contents, but differs in some trace elements such as having much higher Cr (463 ppm vs ≤93 ppm) and Ni (130 ppm vs ≤30 ppm). Greywacke sample IL-14-4, from the north side of Kedears Hill, has relatively high contents of Al2O3 (11.38 wt %) and TiO2 (1.07 wt %). Nearby sample IL-14-5 of felsic tuff contains appreciable K2O (3.57 wt %) but sparse Na2O (0.15 wt %), whereas pyritic rhyolite IL-15-2A, from the same area, has low K2O (0.05 wt %) but high Na2O (10.06 wt %). Table 1. Whole-rock geochemistry of metasedimentary and metaigneous rocks. 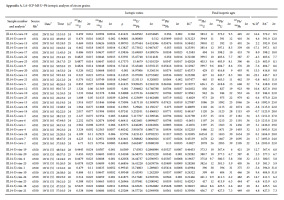 33 Figure 7 shows geochemical plots for the mafic meta-igneous rocks based on whole-rock compositions. 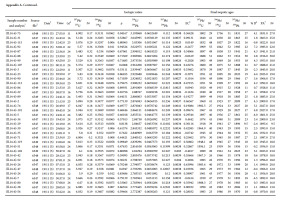 Data for the amphibolite samples from Hutchins Island and Seven Hundred Acre Island, and the plagioclase-chlorite schist from Grindel Point, all plot within the basalt field (Fig. 7A) and the field for Enriched-Mid-Ocean Ridge Basalt (E-MORB) (Fig. 7B). 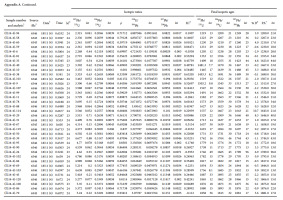 REE data show abundances of ~10× to ~100× chondrite and slightly elevated light rare earth elements (LREE), with amphibolite sample IL-15-4 from Hutchins Island having a positive Eu anomaly (Eu/Eu* = 1.52; Table 1); one amphibolite from Seven Hundred Acre Island is distinct in displaying a higher abundance of LREE and a higher La/Yb ratio (Fig. 7C). 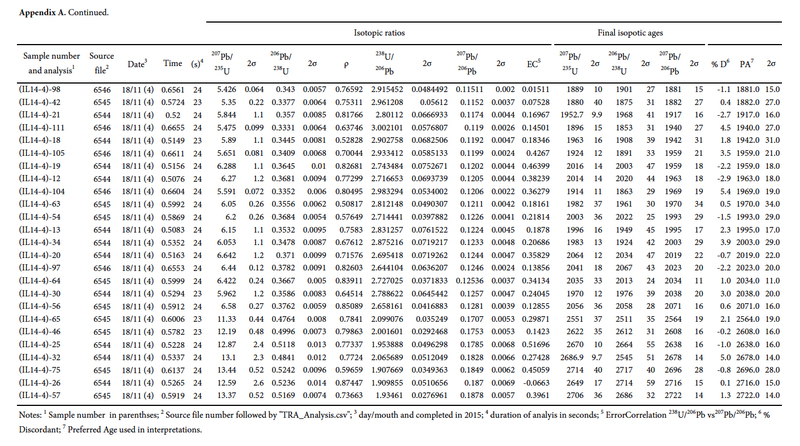 Excluding scatter shown by mobile elements (e.g., U, K, and Sr), most samples of the mafic meta-igneous rocks display broadly similar patterns based on Primitive Mantle normalization, including a lack of negative Ta anomalies and large positive Pb anomalies (Fig. 7D). Figure 7. 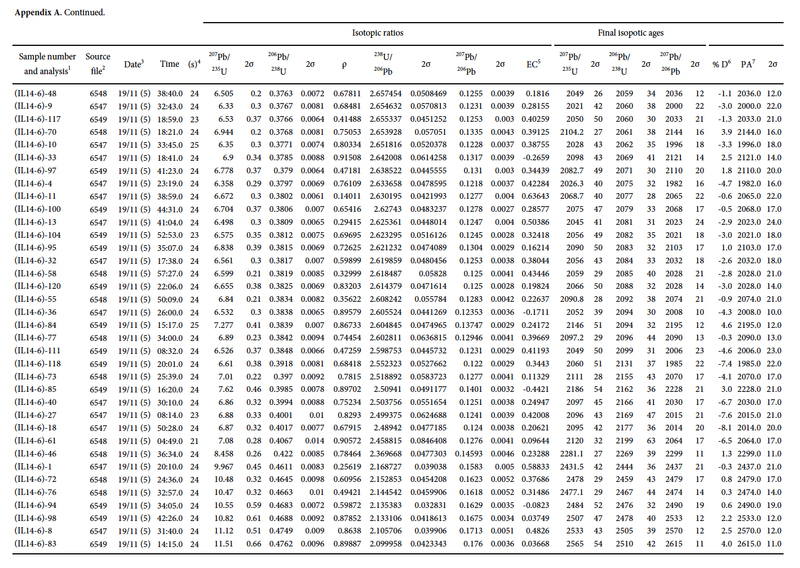 Plots of whole-rock geochemical data for amphibolite and mafic schist. 34 Sample IL-14-6 of quartzite, collected from the south shore of Hutchins Island, yielded 120 concordant U–Pb zircon ages (Fig. 8). Most are centered on ca. 2008 Ma, with minor peaks at ca. 2070, 1965, and 1895 Ma. No ages are younger than ca. 1800 Ma; five fall in the range of ca. 2300 to 2100 Ma. A gap is present between ca. 2400 and 2300 Ma. Nineteen ages are fairly evenly distributed between ca. 2750 and 2400 Ma. Figure 8. Probability density plots of U–Pb ages of zircons listed in Appendix A. 35 Sample IL-14-4, a greywacke collected from near Kedears Hill, yielded 109 concordant U–Pb zircon ages (Fig. 8). A strong late Neoproterozoic maximum at ca. 624 Ma is flanked by lesser peaks at ca. 678, 577, and 515 Ma. 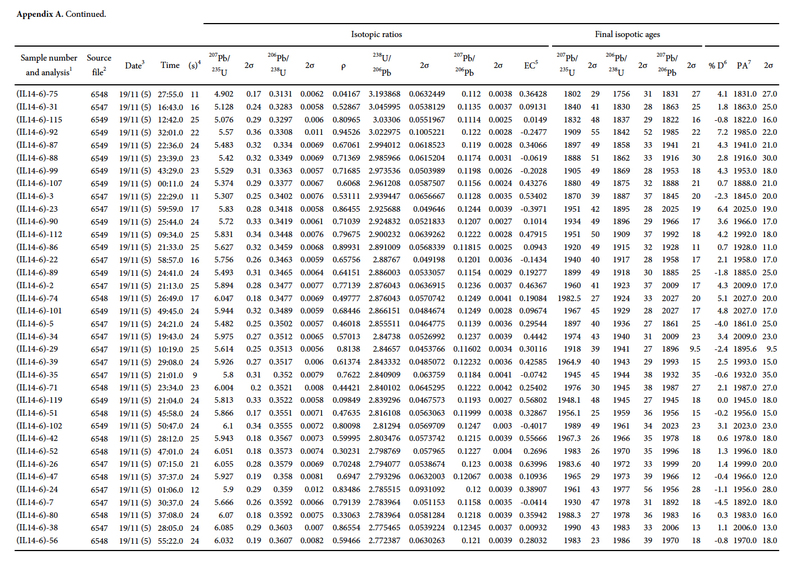 The weighted average age of the three youngest grains is 515 ± 5 Ma and defines the maximum depositional age. Over half of the ages are Mesoproterozoic and Paleoproterozoic (ca. 2000–1000 Ma), with a peak at ca. 1204 Ma and 26 ages between ca. 2100 Ma and 1800 Ma. A gap is present between ca. 2550 Ma and 2100 Ma. The seven oldest ages, all Archean, are in the range of ca. 2750 Ma to 2550 Ma. 36 Sample IL-14-5 was collected from a felsic volcaniclastic rock. The sample had a relatively low yield of zircon (45 grains). 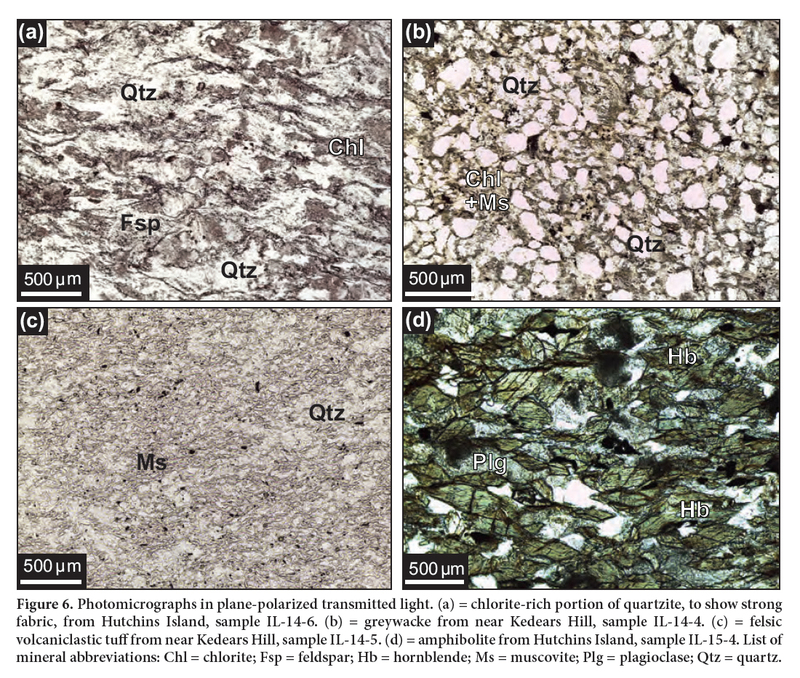 Cathodoluminescence imaging of the zircon grains revealed several core-rim relationships as well as various morphologies including euhedral to anhedral; several of the zircon grains are fragments (Fig. 9). Because of the complex internal textural relationships, several grains were analyzed multiple times to try to date both cores and rims. Inherited cores (and several grains without core-rim relationships) are older than rims. 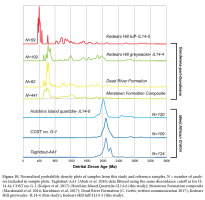 The youngest coherent six grains analyzed define a proposed igneous age of 371.8 ± 5.7 Ma (Fig. 9B). In addition to these youngest Late Devonian ages, described below, the sample includes grains as old as Archean (Fig. 8). Within this older set of ages, all but six are late Paleoproterozoic to early Neoproterozoic (ca. 1900–800 Ma); two are latest Neoproterozoic. The oldest ages include one at ca. 2100 Ma (Paleoproterozoic), one at ca. 2600 Ma (Neoarchean), and two at ca. 3000 Ma (Mesoarchean). Figure 9. 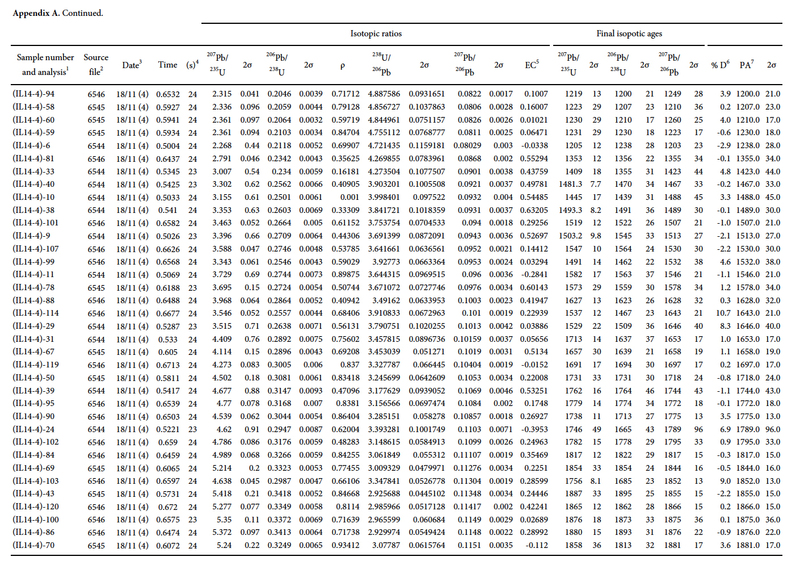 Zircon U–Pb geochronology for Kedears Hill tuff (sample IL14-5). 37 Our data provide important new constraints on several fundamental problems of local as well as broader significance and establish a framework for future investigations in the region. Below, we discuss field, petrographic, geochemical, and geochronological data in the context of new stratigraphy. 38 Stewart et al. (2001) proposed a platform setting for the Seven Hundred Acre Island Formation, and our geochemical data are consistent with a low-latitude, passive-margin setting for the Coombs Limestone and Hutchins Island Quartzite (cf. McLennan et al. 1993). The quartzite has a relatively high Th/Sc ratio of 0.78, which records a predominantly felsic source. A high Zr/Sc ratio of 37.5 for the quartzite implies abundant zircon and/or significant zircon recycling. 39 The distinctive age spectrum of detrital zircon in the quartzite sample (IL-14-6) is unique in the Appalachian orogen, including Gondwanan and peri-Gondwanan terranes, in lacking grains younger than ca. 1800 Ma, its maximum depositional age. The minimum depositional age, based on correlation with the Seven Hundred Acre Island Formation and the age of metamorphism therein, is ca. 670 Ma (Stewart et al. 2001). Of note, the IL-14-6 age spectrum bears a close resemblance to those from strata in Mauritania (West African craton) dated at ca. 1107 Ma but with no zircon younger than ca. 1.8 Ga (Char barcode of Bradley et al. 2015). However, we consider a Paleoproterozoic depositional age for our sample more likely, given (1) a low-latitude, passive-margin setting, and (2) a striking resemblance of the barcode to the detrital zircon age spectrum of a lithologically similar, dated Paleoproterozoic sequence in Morocco. 40 First, Neoproterozoic and Paleoproterozoic passive margins are common but Mesoproterozoic passive margins are not (Bradley 2008). During the Neoproterozoic, Gondwana was located at high paleolatitude (Fyffe et al. 2011; van Staal and Barr 2012). A caveat, however, is that Barr et al. (2014) considered the Neoproterozoic carbonate-rich Ashburn Formation of the Green Head Group in the Brookville terrane, southern New Brunswick, to have been deposited at mid-latitude on the passive Amazonian margin of the Puncoviscana Ocean. 41 Second, both the lithologic assemblage and zircon age spectrum of sample IL-14-6 bear a striking resemblance to those of the Paleoproterozoic Taghdout Group (Fig. 10), located in the Anti-Atlas region of Morocco and considered the passive margin to the Archean-Paleoproterozoic West African craton (Abati et al. 2010; Ikenne et al. 2017). 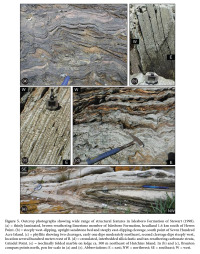 Recently studied metasedimentary rocks from a deep test well on Georges Bank, offshore Massachusetts, USA (Kuiper et al. 2017), which also display a strikingly similar age spectrum to IL-14-6 (Fig. 10), are best explained as a fragment of African crust stranded on the North American plate during the break-up of Pangea. Unlike other terranes of the West African craton known in the Appalachians (i.e., Meguma and Suwannee; see Kuiper et al. 2017), the Taghdout Group, Georges Bank, and Hutchins Island Quartzite lack detrital zircon younger than ca. 1800 Ma, and hence are likely vestiges of the Paleoproterozoic passive margin of the northern West African craton. If this interpretation is correct, a ca. 1800 Ma depositional age implies that the Hutchins Island Quartzite is the oldest known rock unit in the Appalachians. Figure 10. 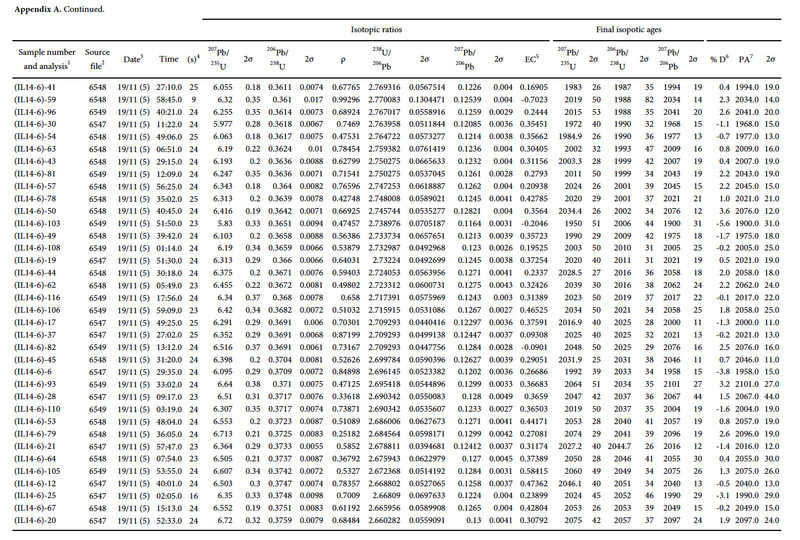 Normalized probability density plots of samples from this study and reference samples. 42 We interpret the zircon grains that constitute the dominant ca. 2 Ga population to be sourced from the Eburnian (ca. 2.1–2.0 Ga) and/or Birimian (ca. 2.2–2.1 Ga) orogens located in the West African craton. An alternative source, near the West African craton, is the Hoggar terrane in southern and western Algeria that contains several quartzite ± marble sequences of ca. 2 Ga age (Caby 2003; Bechiri-Benmerzoug et al. 2017). The relatively small number of ca. 2750–2450 Ma zircon grains may be from the Liberian orogen (ca. 2.9–2.7 Ma). The lack of zircon grains in the range of ca. 2.4 Ma to 2.3 Ma is also consistent with the absence of rocks of this age in the West African craton (Abati et al. 2010). However, the Amazonian craton contains a spectrum of ages that is also broadly similar (Tassinari and Macambira 1999; Abati et al. 2010). For example, the ca. 2750 Ma to 2450 Ma zircons grains in the Hutchins Island Quartzite could be from similar-aged rock in central Amazonia (Restrepo-Pace and Cediel 2010). Detrital zircon data for IL-14-6 alone, therefore, may be insufficient to distinguish between a West African and Amazonian provenance. 43 Prior to this study, the Ashburn Formation of the Green Head Group in the Brookville terrane of southern New Brunswick, based on an abundance of marble, was considered potentially correlative with the Coombs Limestone (Berry and Osberg 1989). However, the Ashburn Formation contains abundant Neoproterozoic zircon in sharp contrast to the absence of zircon younger than ca. 1.8 Ga in sample IL-14-6. Nonetheless, the lithologic resemblance between the Maine and New Brunswick marbles is provocative, and data presented below suggest a close tie between Islesboro and the Grand Manaan and/or Brookville terranes. Within the Grand Manaan terrane, the pre-Ediacaran basement, as on North Islesboro, consists of a carbonate unit (Kent Island Formation) overlain by a quartzite (Thoroughfare Formation) (Fyffe et al. 2009). 44 Whereas geochronological data for the Seven Hundred Acre Island Formation and Rockport Group do not exist, we see no reason not to correlate the Coombs Limestone and Hutchins Island Quartzite with the Seven Hundred Acre Island Formation exposed nearby along strike. Moreover, we agree with Osberg et al. (1985) in their correlation of Proterozoic rocks of Islesboro and the Rockport area. In addition, John Waldron has suggested (oral communication, 2015) that exotic marble in a mélange at the base of the Penobscot Formation at Sherman Point (Fig. 2) might be Proterozoic. Subsequent field observations strongly suggest that these exotic blocks of marble, massive orthoquartzite, and a distinctively bedded quartzite are sourced from the Proterozoic sequence that occurs on Islesboro. Below, we discuss the significance of these blocks in relation to Ordovician tectonism. 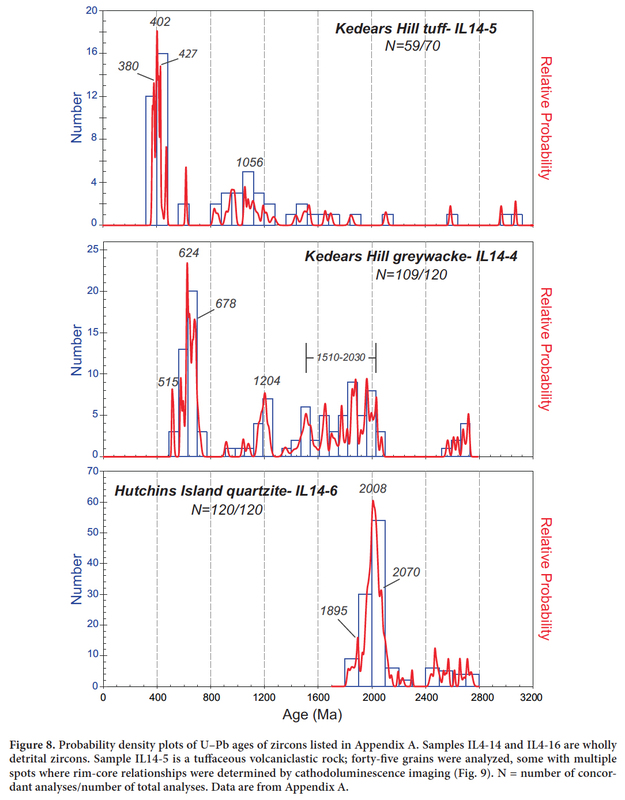 45 Whole-rock geochemical data for relatively immobile trace elements indicate that protoliths of the mafic meta-igneous rocks (amphibolites) from Hutchins Island are basalt (Fig. 7A) having an E-MORB signature (Fig. 7B). Slightly elevated LREE/HREE ratios (Fig. 7C) are consistent with this classification. Importantly, the primitive mantle-normalized plot (Fig. 7D) lacks negative Ta anomalies, which would be evidence of an arc or subduction-related source for the parent basalts (e.g., Pearce et al. 2005). Very similar data reported by Stewart et al. 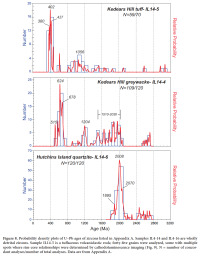 (2001) for amphibolite from the Seven Hundred Acre Island Formation—including large positive Pb anomalies—suggest a common petrogenetic setting. One sample from Stewart et al. 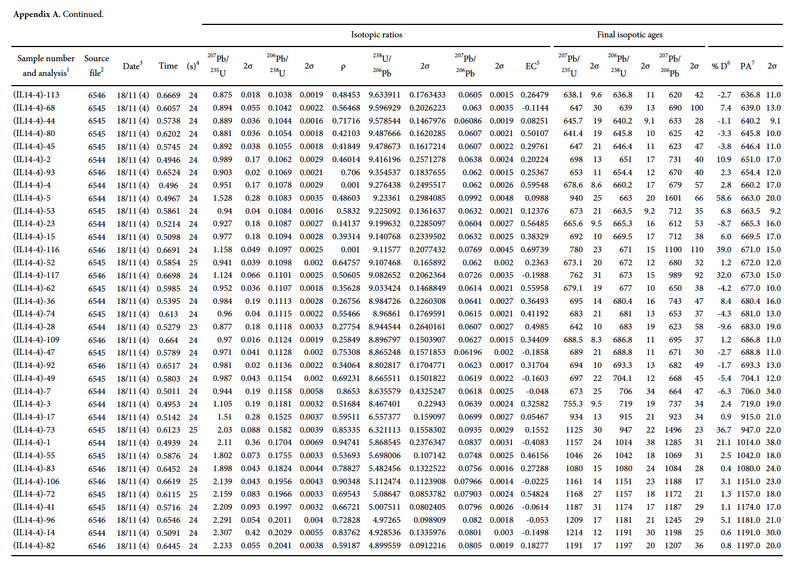 (2001) has a high Nb/Y ratio (Fig. 7A), which may be due to analytical error. 46 Interstratified siliciclastic and carbonate strata and greenstone in the Islesboro Formation are suggestive of a rift setting. 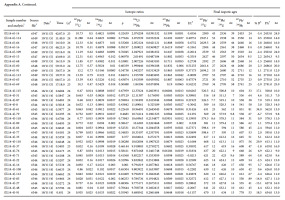 Specifically, sample IL-15-5 is a metabasalt with an E-MORB (non-arc) affinity (Figs. 7B and 7D). A mechanism to explain the interstratified siliciclastic and carbonate metasedimentary rocks is by the erosion of horsts of Proterozoic basement composed of mixed siliciclastic and carbonate strata. 47 The age of the Islesboro Formation is bracketed only between ca. 647 Ma and 420 Ma. However, the present study adds two new constraints. This formation apparently underlies the ca. 515 Ma to 420 Ma Turtle Head Cove unit (Berry and Osberg 1989), discussed below. Newly recognized burrow-like structures, if indeed of this origin, may imply a post-Neoproterozoic age (e.g., Bromley 1996). Although Smith et al. (1907) considered the Islesboro Formation to unconformably overlie the Ellsworth Schist of Middle Cambrian age (Schulz et al. 2008), the two formations share several features, notably the presence of abundant greenstone and a similar deformational style, thus it is possible they are equivalent or nearly so. The Ellsworth terrane, which includes substantial bimodal tuff, has been argued to record Middle Cambrian separation of Ganderia from Gondwana as the Rheic Ocean began to open (Schulz et al. 2008). In this rifting context, inliers of Proterozoic basement and the Deer Isle serpentinite (Fig. 2), viewed as hyperextended basement by Reusch and Rust (2001), may be compared to Grenvillian inliers in the western Appalachians that originated as horsts later decapitated by thrust faults (Karabinos et al. 2017). Hence, the Islesboro Formation may record deposition within adjacent grabens, and the Rockland klippe (Fig. 2) of Proterozoic hanging wall on Ordovician (~Sandbian) footwall may represent an example of a thrust fault-decapitated horst. 48 Van Staal et al. (2012) incorporated the Middle Cambrian rift interpretation of the Ellsworth into a larger framework in which Ganderia departed Gondwana from a location on the Amazonian margin near present-day Columbia. These workers provided extensive arguments for an Amazonian provenance, but a cornerstone of the interpretation is the absence of a Mesoproterozoic sediment source in West Africa. The recent discovery of Mesoproterozoic detrital zircon ages in the foreland of the Mauritanide orogen (Bradley et al. 2015) permits a West African provenance for Ganderia as well. While it is appropriate here to resurrect West Africa as the potential birthplace of Ganderia and to suggest that a West African provenance might imply a simpler tectonic evolution, it is beyond the scope of this paper to fully evaluate all of the arguments for an Amazonian provenance of Ganderia. 49 Greywacke at the base of the Turtle Head Cove unit in the Kedears Hill area displays an immature texture and composition. This rock (Sample IL-14-4) has an intermediate Th/Sc ratio of 0.52, implying a mix of mafic and felsic detritus, and Zr/Sc ratio of 12.9, both of which are lower than in the mature Hutchins Island Quartzite (respectively 0.78 and 37.5). Together, these features argue against a passive- margin setting for the greywacke, the only setting in which maximum depositional age and depositional age are known to differ significantly; we therefore suggest that the sediment age may be close to the maximum depositional age. 50 The depositional age of the greywacke is constrained by the maximum depositional age of 515 ± 5 Ma (Middle Cambrian) defined by detrital zircon geochronology and the minimum depositional age of Late Silurian based on cross-cutting plutons (Tucker et al. 2001). 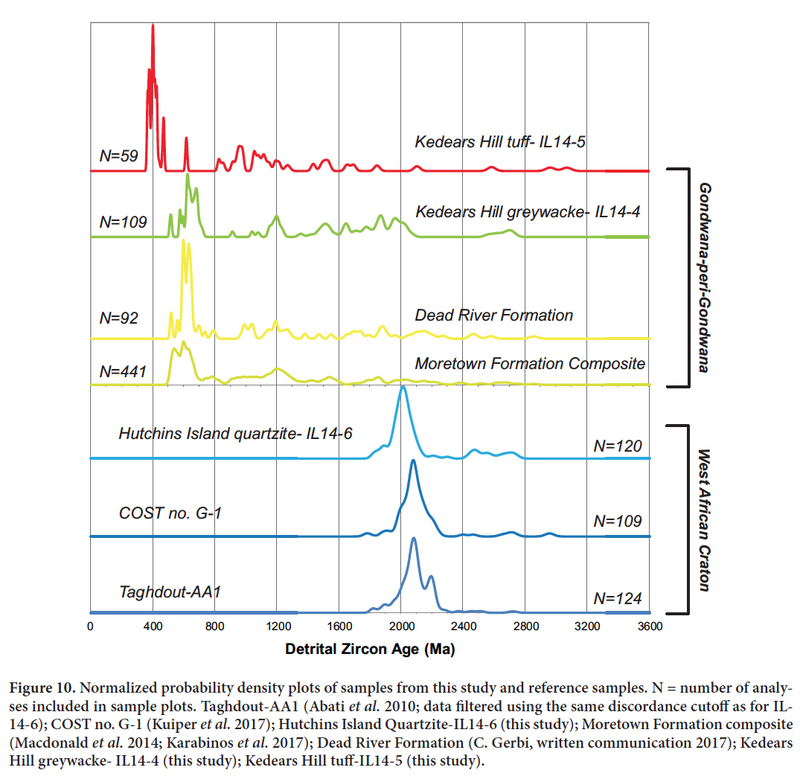 Regional stratigraphic relationships yield a minimum depositional age of late Llandovery, the age of the oldest fossils in the Ames Knob Formation (Brookins et al. 1973) that unconformably overlies both the Ellsworth and St. Croix terranes (Gates 1989). Hence, although a Middle–Late Cambrian age seems most plausible for the greywacke (cf. Nelson 2001), we also consider below the intriguing possibility of an Ordovician depositional age. 51 The detrital zircon signature for this sample, which includes peaks at ca. 624 Ma, 678 Ma, and 577 Ma, is broadly similar to those of other Ganderian metasedimentary units in New England, New Brunswick, and Newfoundland. It is also nearly identical to the Oujeft detrital-zircon barcode, which includes peaks at ca. 624 Ma and 579 Ma, from the younger (late Neoproterozoic) Pan-African foreland basin in Mauritania (Bradley et al. 2015). Sample IL-14-4 has the same maximum depositional age as the Moretown Formation of western New England, the westernmost fragment of Ganderia (Fig. 10; Macdonald et al. 2014; Karabinos et al. 2017). All of the age spectra from these units display large Neoproterozoic–Cambrian peaks between ca. 700 and 500 Ma. In detail, however, the age of the main population(s) across data sets is different. Perhaps the closest match of detrital zircon age population signatures is with that for the Flagg Cove Formation (611 ± 7 Ma with secondary peak at 574 ± 4 Ma) in the Grand Manaan terrane, and for the Martinon Formation (635 ± 4 Ma with secondary peak at 674 ± 8 Ma) in the Brookville terrane (Fyffe et al. 2009). 52 The greywacke displays the well-established detrital zircon signature of Gondwanan provenance—a prominent late Neoproterozoic–Early Cambrian age population (e.g., Barr et al. 2003) in combination with the near-absence of ca. 1 Ga ages. The youngest age populations in the greywacke and in the Ellsworth Schist (Fyffe et al. 2009) overlap, suggesting a common source in the Middle Cambrian. In contrast to the Ellsworth age spectrum, the greywacke lacks a large age population at ca. 545 Ma. The ca. 624 Ma peak matches the age of rocks in the older arc assemblage in the Brookville terrane (Barr et al. 2014). The distribution of Mesoproterozoic ages is consistent with an Amazonian provenance, but also with recently dated rocks of Mesoproterozoic age in West Africa (Bradley et al. 2015). Hence, the small number of ages at ca. 1200 Ma might be linked to sources in either Amazonia or West Africa. 53 In New Brunswick, pre-Middle Ordovician deformation is documented in the Annidale terrane (Johnson et al. 2012). New River basement was thrust northwest over equivalents of the Gushee Volcanics Member of the Penobscot Formation prior to intrusion of the ca. 474 Ma Stewarton Gabbro. In Penobscot Bay, the Ellsworth terrane is in similar thrust relationship with black shale of the Penobscot Formation (Reusch 2002b), but neither stitching plutons nor an overlap sequence has been recognized. An Ordovician age for the Turtle Head Cove unit would strongly suggest that it represents Penobscottian cover. A point in favor of this interpretation is the abundance of Mn-coated pelite in strata of the Turtle Head Cove unit, which is a characteristic of the Davidsville Group that constitutes Penobscottian cover in Newfoundland (Waldron et al. 2014a). 54 A compelling argument for pre-Middle Ordovician (Penobscottian) deformation locally is based on recognition during this study of exotic blocks in mélange at the base of the Early Ordovician Penobscot Formation (Sherman Point, Fig. 2) that are lithologically indistinguishable from Proterozoic strata on Islesboro. In particular, marble, orthoquartzite, and distinctively bedded quartzite occur both as exotic blocks in the mélange and as coherent strata of the Coombs Limestone and Hutchins Island Quartzite on North Islesboro. Regardless of whether the mélange is an olistostrome or tectonic in origin, Proterozoic basement must have been exhumed by the Early Ordovician. We consider this strong evidence for primary juxtaposition of the St. Croix terrane, Islesboro block, and Ellsworth terrane at this time as along the Cold Spring Melange in a similar tectonic setting in Newfoundland (Williams and Piasecki 1990). Previous hyperextension during Middle Cambrian rifting is a likely mechanism to have exhumed the basement. 55 It remains unclear whether the Turtle Head Cove unit constitutes a typical “older Gander margin” quartzose apron or a post-Early Ordovician “younger Gander margin” on the Penobscottian orogen. This unresolved issue has great significance for a first-order problem in Appalachian tectonics, as to whether closure of the Iapetus Ocean occurred (1) by subduction initiated internally (van Staal et al. 2012), or (2) by subduction having entered Iapetus from outside (subduction infection of Waldron et al. 2014b). More recently, Waldron et al. (2015) have argued that if the timing of strong northwest-vergent deformation of the Ellsworth terrane was pre-Middle Ordovician, then subduction can be explained more easily by a Caribbean-style subduction infection scenario (Waldron et al. 2014b) than by an internal, orogen-parallel initiation of subduction (van Staal et al. 2012). 56 Ganderia and Avalonia are less easily distinguished in Maine and New Brunswick than in the type area of Newfoundland (Fig. 1). Landing (1996) recognized lower Paleozoic formations characteristic of Avalonia in the New River terrane (Ellsworth correlative) of coastal New Brunswick. 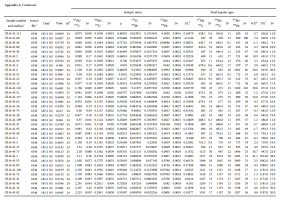 However, other workers (e.g., van Staal et al. 2004; van Staal and Barr 2012) have emphasized contrasts, and include both the New River and Brookville terranes within Ganderia. As an example of one contrast, Ganderia is characterized by basement that is more isotopically evolved than that in Avalonia (van Staal et al. 2009). The presence of Proterozoic continental basement on Islesboro as well as detrital zircon ages in the range ca. 1.2 Ga to 2 Ga in quartzite sample IL-14-4, therefore, support a Ganderian affinity (cf. Stewart and Lux 1988). 57 The youngest zircon age population (based on the youngest three grains) in the volcaniclastic tuff is 371.8 ± 5.7 Ma. These Famennian zircon grains are euhedral (Fig. 9C), which strongly suggests an igneous source and minimal sedimentary transport. An alternative interpretation for this young population involving contamination of a Cambrian–Ordovician rock by glacial detritus cannot be ruled out, but is considered unlikely because of the very small fraction of material with such a possible origin, relative to that of the rock, and because of the absence of abundant Cambrian and Neoproterozoic grains that characterize the nearby greywacke (Fig. 10). 58 The Famennian age proposed here for the felsic tuffaceous rock, while common for some local plutons, is young in the context of other sedimentary and volcanic strata of Maine. 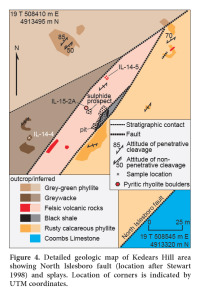 A possible correlative is rhyolitic tuff of the Carrow Formation (Piskahegan Group) in southern New Brunswick, sourced from the Mount Pleasant caldera (McCutcheon et al. 1997), which has a TIMS U–Pb age of 363.8 ± 2.2 Ma (Tucker et al. 1998). Felsic igneous rocks of similar age also occur in the Magdalen basin of eastern Canada (Dunning et al. 2002) and the Narragansett basin of southeastern New England (Thompson and Hermes 2003). However, the euhedral crystals that make up the youngest age population in the Kedears Hill tuff argue for minimal if any long-distance fluvial transport, thus favoring a model involving the deposition of this population from a widely dispersed, caldera-sourced pyroclastic sheet. 59 Significantly, the pyrite prospect in this same area—within nearby albitized rhyolite—is the only post-Acadian, submarine volcanogenic sulphide occurrence in the Appalachians (e.g., Gair and Slack 1980; Sangster 1980). The original sulphide mineralization is interpreted to have formed on or near the seafloor, based on the presence of stratiform thin layers of pyrite in black shale at the prospect, and detrital grains of coarse pyrite within calcareous sandstone in shoreline outcrops on the east side of Turtle Head near the neck. 60 The tuff includes a detrital zircon signature traditionally interpreted as Grenvillian, specifically a broad peak at ca. 1 Ga (Fig. 8). The age spectrum also includes (1) minor contributions from a Neoproterozoic source, presumably peri-Gondwanan rocks that by the Late Devonian were accreted to Laurentia; (2) Mesoproterozoic ages as occur in the greywacke; and (3) oldest grains of ca. 3 Ga having possible sources either in the Leonean belt of the West African craton or the Nain craton of Laurentia. 61 Post-Late Devonian deformation, documented southwest of Saint John, New Brunswick, by the presence of several klippen of Proterozoic rocks on Carboniferous strata (Barr et al. 2014), has not been recognized previously in Penobscot Bay. Hence, the discovery of Late Devonian volcaniclastic rock with a penetrative fabric may represent the first local example of Neoacadian or Alleghanian deformation. 62 U–Pb zircon geochronology of metasedimentary and metavolcaniclastic rocks from North Islesboro, Penobscot Bay, Maine, confirms a Ganderian identity for the Islesboro block located between the St. Croix and Ellsworth terranes. In the context of recently dated detrital zircon from fore-land basin strata in Mauritania (Bradley et al. 2015), these data permit a West African craton provenance for Ganderia. A mélange at the base of the nearby Lower Ordovician Penobscot Formation contains exotic blocks lithologically indistinguishable from Proterozoic strata on Islesboro, relationships consistent with previously suggested lithospheric extension (Reusch and Rust 2001) during the Middle Cambrian departure of Ganderia from Gondwana (Schulz et al. 2008; van Staal et al. 2012) and subsequent Penobscottian collision during the initial stage of closure of the Iapetus Ocean (Johnson et al. 2012; Waldron et al. 2015). Quartzite on Hutchins Island is potentially the oldest rock known in the Appalachian orogen; the foliated Late Devonian volcaniclastic rock in the Kedears Hill area represents the first documentation of late Paleozoic deformation in Penobscot Bay. We are grateful to Renee Pillers of the USGS (Denver) for preparing zircon separations and mounts. Thanks to Henry Berry (Maine Geological Survey) and Dwight Bradley (USGS Emeritus) for helpful discussions, and to John Waldron (University of Alberta) and Justin Strauss (Dartmouth College) for discussions in the field. Carter Hearn (USGS Emeritus) provided copies of unpublished 1968 field notes and maps of Islesboro prepared by Dave Stewart and colleagues. We also thank Byron Crosby and Sandy Sabaka (Maine Bureau of Parks and Lands) for boat transport. Field work on Islesboro by Reusch was supported in part by the Maine Geological Survey. Klaus Schulz (USGC), Dwight Bradley, Yvette Kuiper (Colorado School of Mines), and an anonymous referee provided very thorough and helpful reviews of the manuscript. Berry, H.N., IV 2007, Grindle Point, Islesboro, Maine. Maine Geological Survey, Augusta, Maine, Maine geologic facts and localities, 12 p. URL <http://digitalmaine.com/cgi/viewcontent.cgi?article=1418&context=mgs_publications>, 20 July, 2017. Berry, H.N, IV. (Compiler). in press. Bedrock geology of the Augusta 1:100 000 quadrangle, Maine. Maine Geological Survey, Augusta, Maine, USA, scale 1:100 000. Berry, H.N., IV and Osberg, P.H. 1989. A stratigraphic synthesis of eastern Maine and western New Brunswick. In Structure and stratigraphy. Edited by R.D. Tucker and R.G. Marvinney. Maine Geological Survey, Augusta, Maine, Studies in Maine Geology, 2, pp. 1–32. Berry, H.N., IV and Osberg, P.H. 2000. The Megunticook Formation. In Guidebook for field trips in coastal and east-central Maine. Edited by M.G. Yates, D.R. Lux, and J.T. Kelley. New England Intercollegiate Geological Conference, 92nd Annual Meeting, October 6–8, 2000, Orono, Maine, pp. 54–70. Berry, H.N., IV, Schoonmaker, A., and Guidotti, C.V. 2000. The Benner Hill sequence. In Guidebook for field trips in coastal and east-central Maine. Edited by M.G. Yates, D.R. Lux, and J.T. Kelley. New England Intercollegiate Geological Conference, 92nd Annual Meeting, October 6–8, 2000, Orono, Maine, pp. 187–207. Bickel, C.E. 1971. Bedrock geology of the Belfast quadrangle, Maine. Unpublished Ph.D. thesis, Harvard University, Cambridge, Massachusetts, 342 p.
Bradley, D.C., O’Sullivan, P., Cosca, M.A., Motts, H.A., Horton, J.D., Taylor, C.D., Beaudoin, G., Lee, G.K., Ramezani, J., Bradley, D.B., Jones, J.V., and Bowring, S. 2015. Synthesis of geological, structural, and geochronologic data (phase V, deliverable 53). In Second projet de renforcement institutionnel du secteur minier de la République Islamique de Mauritanie (PRISM-II). Edited by C.D. Taylor. U.S. Geological Survey Open-File Report 2013–1280-A, 328 p. [In English and French.] URL <https://doi.org/10.3133/ofr20131280A>, 20 July, 2017. Burke, W., West, D.P., Jr., and Coish, R. 2016. Petrology and geochemistry of metamorphosed Cambrian–Ordovician volcanic rocks of the St. Croix belt, western Penobscot Bay, Maine. Geological Society of America Abstracts with Programs, 48(2), unpaginated. Gair, J.E. and Slack, J.F. 1980. Stratabound massive sulfide deposits of the U.S. Appalachians. In Review of Caledonian-Appalachian stratabound sulphides. Edited by F.M. Vokes and E. Zachrisson. 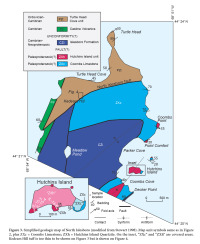 Geological Survey of Ire-land Special Paper, 5, pp. 67–81. Gates, O. 1989. Silurian roundstone conglomerates of coastal Maine and adjacent New Brunswick. In Studies in Maine geology. Edited by R.D. Tucker and R.G. Marvinney. Maine Geological Survey, Augusta, Maine, pp. 127–144. Gregg, W.J. 1979. The development of foliations in low, medium, and high grade metamorphic tectonites. Unpublished Ph.D. thesis, State University of New York at Albany, Albany, New York, 230 p.
Hibbard, J.P., van Staal, C.R., Rankin, D.W., and Williams, H. 2006. Lithotectonic map of the Appalachian orogen (North), Canada–United States of America. Geological Survey of Canada, Map 02042A, scale 1:1 500 000. Ludwig, K.R. 2012. User’s Manual for Isoplot/Ex, Version 3.75. 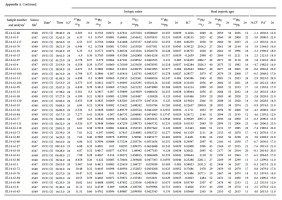 A geochronological toolkit for Microsoft Excel: Berkeley Geochronology Center, Berkeley, California, Special Publication, 5, revised January 2012, 75 p.
Osberg, P.H., Hussey, A.M., II, and Boone, G.M. (Editors). 1985. Bedrock geologic map of Maine. Maine Geological Survey, Augusta, Maine, scale 1:500 000. Pearce, J.A. 1996. A user’s guide to basalt discriminant diagrams. In Trace element geochemistry of volcanic rocks: applications for massive sulphide exploration. Edited by A.H. Bailes et al. Geological Association of Canada Short Course Notes, 12, pp. 79–113. Pearce, J.A., Stern, R.J., Bloomer, S.H., and Fryer, P. 2005. Geochemical mapping of the Mariana arc-basin system: implications for the nature and distribution of subduction components: Geochemistry, Geophysics, Geosystems, 6, 27 p.
Reusch, D.N. 2002a. The Ellsworth Schist, Maine: Acadiantelescoped rift sequence or Penobscottian accretionary complex? Geological Society of America Abstracts with Programs, 34(1), p. 76. Reusch, D.N. 2002b. Tectonic evolution of the Ellsworth terrane. Unpublished field guide for Geological Society of Maine Summer Field Trip, August 2-4, 2002, 13 figures, 16 p.
Reusch, D.N. 2003. Bedrock geology of the mainland portion of the Newbury Neck and Salsbury Cove 7.5-minute quadrangles. Maine Geological Survey, Open-File No. 03–92, 14 p.
Reusch, D.N. and Rust, K.L. 2001. Post-rifting fate of the peri-Gondwanan Ellsworth Schist, Newbury Neck, Maine. Geological Society of America Abstracts with Programs, 33(1), p. A-79. Reusch, D.N., van Staal, C., Barr, S.M., and Yates, M. 2003. Ultramafic and sedimentary dikes, Penobscot Bay: Cambrian extension and Ordovician accretion along southeastern Ganderia. 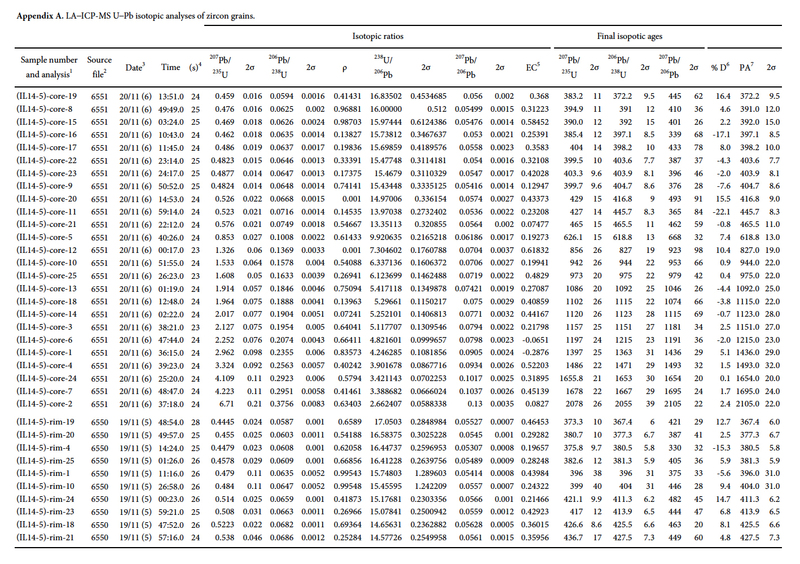 Geological Society of America Abstracts with Programs, 35(3), pp.78–79. Sangster, D.F. 1980. A review of Appalachian stratabound sulphide deposits in Canada. In Review of Caledonian-Appalachian stratabound sulphides. Edited by F.M. Vokes and E. Zachrisson. Geological Survey of Ireland Special Paper, 5, pp. 7–18. Smith, G.O., Basin, E.S., and Brown, C.W. 1907. Description of the Penobscot Bay quadrangle, Maine. U.S. Geological Survey Geologic Atlas, Folio 149, 14 p., scale 1:125 000. Stewart, D.B. 1998. 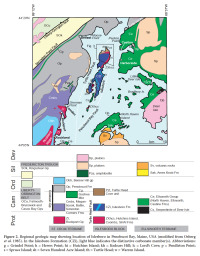 Geology of northern Penobscot Bay, Maine. U.S. Geological Survey Miscellaneous Investigations Series Map I-2551, 2 sheets, scale 1:62 500. Tassinari, C.C.G. and Macambira, M.J.B. 1999. Geochronological provinces of the Amazonian craton. Episodes, 22, pp. 174–182. Van Staal, C.R. and Barr, S.M. 2012. Lithospheric architecture and tectonic evolution of the Canadian Appalachians and associated Atlantic margin. In Tectonic styles in Canada: the Lithoprobe perspective. Edited by J.A. Percival, F.A. Cook, and R.M. Clowes. Geological Association of Canada Special Paper, 49, pp. 41–95. Van Staal, C.R., McNicoll, V., Valverde-Vaquero, P., Barr, S.M., Fyffe, L.R., and Reusch, D.N. 2004. Ganderia, Avalonia, and the Salinic and Acadian orogenies. Geological Society of America Abstracts with Programs, 36(2), p. 128. Waldron, J.W.F., Schofield, D.I., and Reusch, D.N. 2015. Arc-microcontinent interaction in the early history of the Iapetus Ocean. Geological Society of America Abstracts with Programs, 47(7), p. 861. Williams, H. 1978. Tectonic-lithofacies map of the Appalachian orogen. Memorial University of Newfoundland, St. John’s, Newfoundland, Map no. 1, scale 1:2 000 000. Appendix A. LA – ICP-MS U – Pb isotopic analyses of zircon grains.